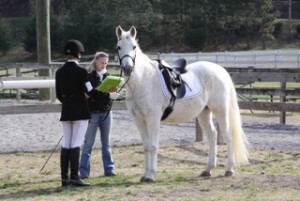 Molly Ryan, a C+ Dressage member of the Sinking Creek Pony Club in the Old Dominion Region submitted the following story as her entry for the Flash Teamwork Award for 2015. One of a few finalists, Pony Club wanted to share the story of this fabulous Pony Club horse who has taught many members the ropes of Pony Club. Enjoy! What’s Up Doc didn’t begin his life as the ideal Pony Club mount; he was, in fact, quite the opposite. Barely 14.2 hands, with a surprising wild streak and intense fear of thunder, Doc arrived at Harmony Hills Equestrian Center, the home of Sinking Creek Pony Club, with little training aside from running barrels and trail riding. When he first arrived, it seemed impossible that he would ever be a suitable mount for children, let alone Pony Club. Since then, Doc has proven that sometimes the best team players sometimes come in unlikely packages. In the entire existence of Sinking Creek Pony Club, Doc has always been the equine glue holding the club together. With his exceptionally gentle spirit, kind heart and endless patience, he quickly learned the ropes of being a beginner-safe horse and he has been the obvious choice for rising stars and young members, guiding them through first trot steps, first canter steps, first jumps, to first mounted meetings, and first rallies. With his surprising athleticism, unbeatable work ethic, and endless determination, he has been a schoolmaster for older members wishing to learn upper level dressage, and has competed in recognized USDF competitions with great success. Doc is a special horse in every sense of the word. While he has shown the traditional qualities of teambuilding, he has also shown that teambuilding can occur in more unconventional ways. To tell a personal story, I remember being a young D-3, preparing to compete in my first show jumping rally. When my planned mount went lame, Doc, as usual, was the backup. One quirk that Doc has, however, is a dislike of any sort of jumping. At that rally, I got eliminated in every course. While this may have been considered a negative experience, it was because of Doc that the concept of teamwork was truly instilled in me. When I was upset, my team and club rallied around me, and we came together and were much stronger together through that experience. All the while, it was as if Doc knew that sometimes through perceived failure, we are able to learn the meaning of teamwork, and the true value of sportsmanship. Since then, Doc has competed in countless D-rallies, Show Jumping rallies, Dressage rallies, and even Polocrosse rallies. In addition, he competed at Pony Club National Championships on four separate occasions, with three different members, and was a member of the winning 2012 Training Level Dressage team, with scores in the upper 60s and low 70s every round. He has also been the recipient of the Dover ‘I Love Pony Club’ pin twice, both times as a member of a pas-de-deux, with both scores exceeding 80 percent with two different riders. Doc has also been an impressive competitor in USDF recognized competitions. He competed at training and first level with author Molly Ryan for three straight years, frequently winning, and was ranked 32nd in the nation at training level in 2012, at the age of 18. Despite his fleabitten gray coloring, Doc has been a dark horse in every sense of the word. While guiding younger members in their first steps of Pony Club, he has also been an invaluable backup mount when necessary, always ready and always enthusiastic. An unknown mix of quarter horse and Arabian, he isn’t the most impressive at first, but in any task he does, his kindness, spirit, and endlessly giving heart shine through. Today, at 20 years old, Doc is enjoying semi-retirement. He was formally recognized at Pony Club Nationals in 2015 as officially retiring from competition. However, at home, he still hasn’t slowed down. He continues to teach young members, building their confidence, teaching them the meaning of horsemanship: sometimes through great success in first canter steps, sometimes in a well-deserved tumble when he stops at a crossrail. He enjoys the occasional frosted donut and peanut butter cookie, and loves evening trail rides and occasionally schooling upper level dressage. Doc is truly the most valuable player of our pony club. Without him, not only would countless important lessons in teamwork, horsemanship and sportsmanship be missing, but it seems that our club would struggle to exist at all. He is the uniting factor that all our members have in common – at one point or another, we have all ridden and learned something from Doc. Doc is not only a team builder, not only a team player, but more than that, he is the root of the community and fellowship of our club. Personally, I believe that while team building can certainly be learned, the truest team builders have it ingrained in their heart and spirit. Doc has proven time and time again that being a team player is not something he learned, but something he was born with in his heart. I know that I am not the only member of my club who would agree – there is no better teammate than Doc. Considering all of the lives he has touched, seems to me, Doc could write a wonderful book.